There’s something beyond exciting to me about going to the theater. I love all of it; dressing up –just a little bit (or not), gathering my special people, finding our seats, that first moment when we take in the set and stage, the anticipation of a good story well-told. More than that I feel like a good parent by taking my children to be part of the magic. 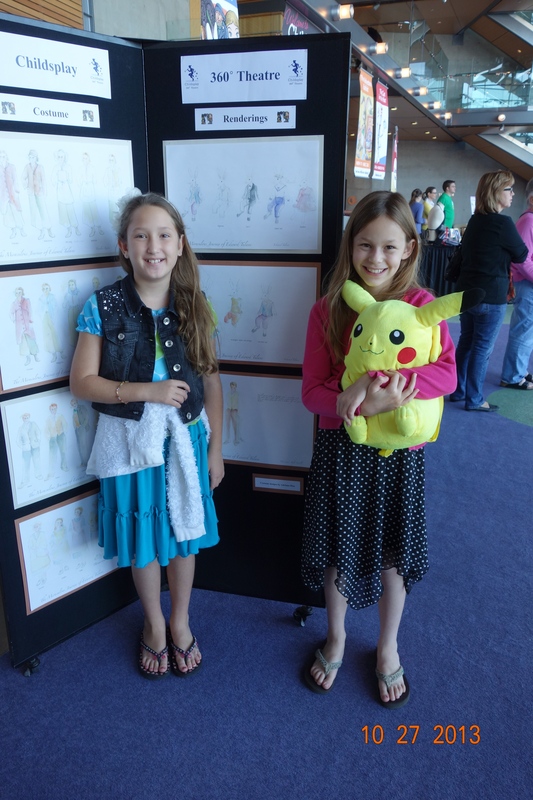 Exposing them to the new ideas, great literature and worlds of imagination the theater offers is very satisfying to me as a Mom. I guess it’s safe to say, the theater is one of my happy places. Given that starting point, I was more than pleased to have the opportunity to see The Miraculous Journey of Edward Tulane with my daughter and some good friends this past weekend. This theater production is beautifully written by Dwayne Hartford and is based on the book of the same name by Kate DiCamillo, an award-winning author of (in my opinion) some truly outstanding contemporary literature for children. The story is about a much-loved china rabbit named Edward Tulane who is the proud owner of a trunk full of fancy clothes and a rabbit-sized gold packet watch. At the start of his journey Edward spends his days being doted on by a loving little girl named Abilene, but being an egotistical little toy he is incapable of thinking beyond his own self-centeredness. Through a series of events Edward gets lost and the rest of the play tells of his adventures following his separation from Abilene. From one unlikely place to the next Edward becomes part of the story of everyone he meets, and they in turn become part of his—teaching him a little more about love at every turn. This production includes a huge assortment of characters all convincingly performed by four über-talented Childsplay performers. To say I was impressed by how the cast of this play led the audience through Edward’s remarkable journey falls short. Kyle Sorrell, The Musician, was amazing as the voice of Edward. 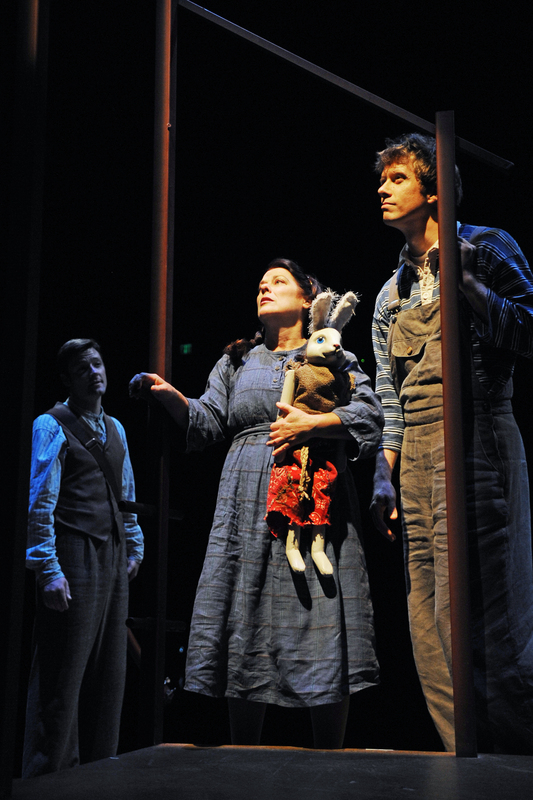 His was the task of portraying Edward’s transformation from pompous little twit to “rabbit on the run” whose heart gets “opened wide, and wider still” through the course of his journey. Katie McFadzen, Debra K. Stevens and David Dickenson performed the roles of The Traveler, The Woman, and The Man, and each portrayed a whole host of different characters in the story. 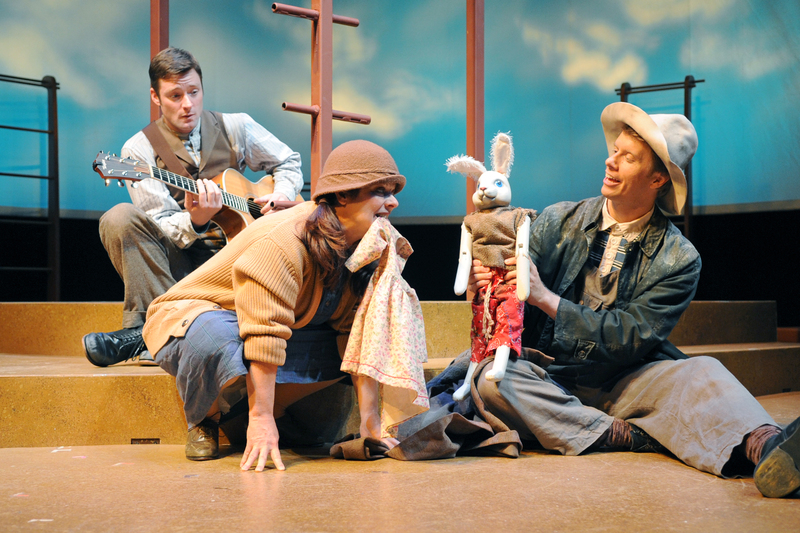 There is a lot to love about The Miraculous Journey of Edward Tulane. On stage where things unfold through action and dialogue it’s uncommon to have a hero that can’t move or speak. 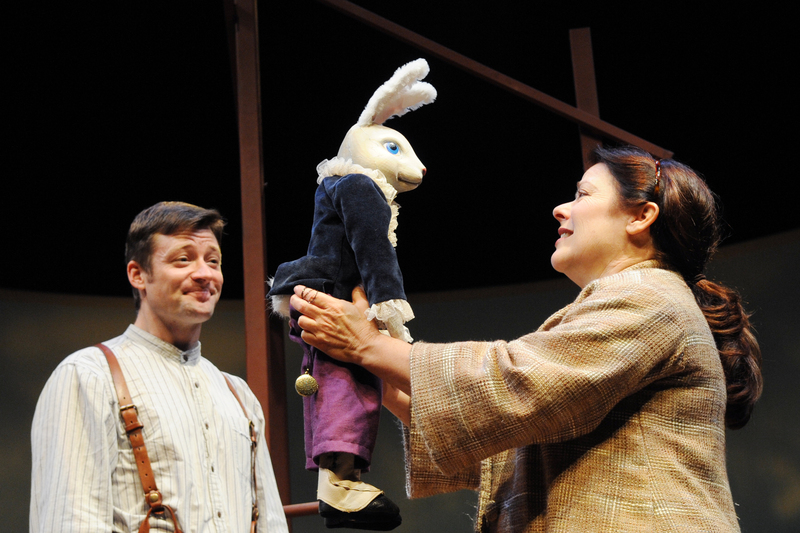 The fact that most of this play centers around the interior life of an inanimate china rabbit whose thoughts and feelings are known to the audience and are interpreted by every character he meets is unique and interesting. There was a guitar, a banjo and a violin, there were harmonicas and shadow puppets; from the bottom of the ocean to high up among the night time stars, there were diverse landscapes and far reaching stories. Everything was brought to life by the actors who swept the audience along in this amazing tale. I think this play was made extraordinary by wonderful writing the talent of these four performers. At times funny, the story of how Edward learns to love is NOT light-hearted. It is rich, beautiful, bitter-sweet and sometimes very sad. There are tough characters and a few decidedly UNHAPPY endings along the way. The play presents love in all its sweetness, joy, and heartbreak and does not shy away from laying it all out before us—the tragic along with the beautiful. As much as my daughter and I took away from this play, there’s no doubt it would have been too sad for my younger son who was inconsolable after Charlotte’s Web. He ended up not able to go with us at the last minute and in retrospect I was glad things worked out the way they did. That said, I do wholeheartedly recommend this play with the knowledge that it lovely, and (very) sad in parts. You’ll have to gauge its suitability for your children accordingly. As always, Childsplay provided an excellent opportunity after the play to connect with the performers and we were given a great set of thought-provoking questions to take with us for the ride home. Lobby displays had information about hobo life and culture and there were shadow puppet crafts for the kiddos to make during intermission. We really liked all these “extras” which will serve as the starting point for ongoing discussions, I’m sure. 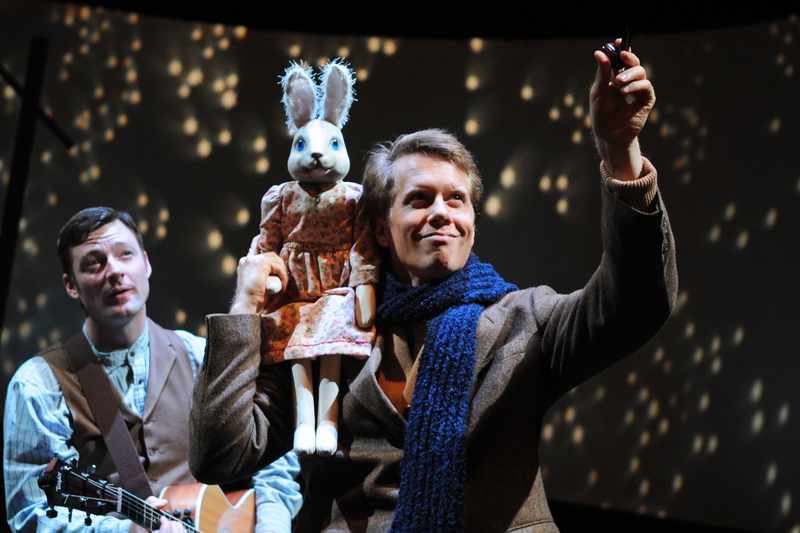 To sum up I have to say that we truly enjoyed The Miraculous Journey of Edward Tulane. The premise that we are all on our own journey through life and each person we love is a brand new opportunity to learn about its meaning—resonates with me. I was so happy to have shared this treasure with my nine year old daughter, who was riveted the entire time. This is a girl who has not been without a favorite stuffed animal side-kick every step of the way since she could walk, so she naturally connected to Abilene and Edward in a very real way. We took it all in, grabbing hands at the sad parts and afterward when I asked what she thought the main message was my daughter answered, “You need to learn how to love and be loved in life or there will be consequences.” I had to laugh. That evening she wanted nothing more than to sit down and start reading the book the play was based on rather than play Wii or watch TV… umm—enough said right there?? On behalf of my daughter and myself, I’d like to thank the wonderful folks at Childsplay for this amazing experience. We’re sure to think about it for a long time to come. Following the performance the cast threw this question out to the audience: “Who teaches you about love?” I thought that was quite a parting gift.